This report presents key juvenile justice data in the North Lawndale community. North Lawndale is located on the west side of Chicago and was once known as the home of Sears and Roebuck. In the past few decades, the community has fallen on hard times as it has steadily lost population. Over 40,000 people now live in North Lawndale. 94% of the population is Black. Chapin Hall estimates that 7,786 children and youth ages 5–17 live in the neighborhood. Over 20% of youth ages 16–19 in North Lawndale are classified as “disconnected” which means that they are neither enrolled in school or employed (US Census Bureau, 2000). The Chicago Police Department reports data by district rather than by zip codes. North Lawndale is served by two police districts; the 10th which includes North Lawndale College Prep and the Lawndale Christian Development Corporation for example and the 11th which encompasses Homan Square and Manley High School. The 10th district also serves South Lawndale while the 11th serves parts of the Garfield Park community. It is important to keep this information in mind while reviewing the data presented in this report. North Lawndale is notorious for the number of its youth who are in trouble with the law. 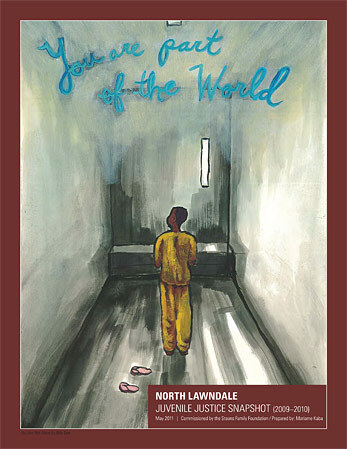 Living next door to the largest juvenile jail in the nation, the Cook County Juvenile Temporary Detention Center (JTDC), many of Lawndale’s youth find themselves swept into the juvenile legal system. The consequences for these youth are devastating.